In spite of a more than three decades on the New York City front line, saxophonist Andrew Lamb remains something of an unknown quantity. Over that time he has amassed only eight leadership dates, the majority on small independent labels. To that total can be added Rhapsody In Black, a live blowing session from 2008 which feels as if it could have been recorded any time since the late '70s. Indeed, Lamb imbues his sound with the spirituality of late period John Coltrane, smoldering with a slow burning passion, bordering on the ecstatic, recalling his early AACM mentor, reed man Kalaparush Maurice McIntyre. The dual percussion of downtown stalwart Michael Wimberly and Guillermo E. Brown (best known from his stint with saxophonist David S. Ware) establishes an ethnic feel, an element of ritual, which together with the sporadic didgeridoo of enterprising bassist and tubaist Tom Abbs, create a seething rhythmic backdrop for Lamb's ruminations. Using simple phrases and restated motifs, the horn man creates a solid backbone from which the improvisations sally forth, begetting a satisfying sense of structure. Abbs shares not only a long tenure with the leader, but also that same ability to impart cohesion to spontaneous playing through judicious use of reiterated patterns and riffs, though in his case frequently disrupted by forays into freer territory. Lamb's strongest statements come on tenor saxophone where his muscular burnished tone enthralls, sticking largely to an incantatory middle register, only sparingly overblowing hymn like cadences. But he also deploys throaty clarinet on the opening "Initiation," which like all the cuts, builds slowly from sparse beginnings to an impassioned crescendo, and blows airy flute with a haunted melodicism on "To Love In The Rain (Portrait Of A Virtuous Woman)" before conjuring more primeval textures by blowing conch shell later in the piece. Abbs combines deep powerful bass calisthenics with occasional simultaneous blurts on tuba which ratchet up the excitement levels. The twin drummers, well separated in the mix, though not identified by channel, don't overwhelm and leave space for both each other and the bass and horns, roiling in tandem only during the standout title track and the closing "Song Of The Miracle Lives. Though undoubtedly captivating in concert, the uncomplicated building blocks mean that the set fares slightly less well on repeated listens, but nonetheless represents a valuable addition to a slender discography. Track Listing: Initiation; Rhapsody In Black; To Love In The Rain (Portrait Of A Virtuous Woman); Song Of The Miracle Lives. 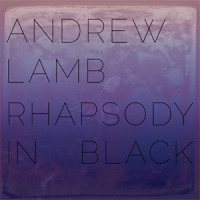 Personnel: Andrew Lamb: tenor saxophone, flute, clarinet, conch shell; Tom Abbs: bass, tuba, didgeridoo; Michael Wimberly: drums and percussion; Guillermo E. Brown: drums and percussion.